Yesterday I wrote about how we test whether unitless constants such as alpha (α) change over the history of the universe. You might also have noticed that I said if such constants did change, then it would mean either fundamental physical constants change or there is some exotic physics going on. We looked at the physical constants yesterday, so today let’s look for exotic physics. As I mentioned yesterday, the value of alpha can affect the line spectra of atoms and molecules, which makes it easy to observe astronomically. In testing for changes in alpha over space and time, astronomers looked at distant molecular clouds. These are low-gravity environments, so they are similar to the type of environment we have here on Earth. But if you want to look for exotic physics, you probably want to look for situations that are either very high energy, or very high gravity. Since alpha depends on three constants (electron charge, light speed, and Planck’s constant), it shouldn’t be affected by strong gravitational fields such as the ones near a white dwarf or neutron star. But there are theoretical models that connect Planck’s constant to the universal gravitational constant (G). These models attempt to develop a theory of quantum gravity which would connect quantum theory to general relativity. Some of these models introduce things that would allow the gravitational field to change the value of alpha. Of course this change would only be seen with very strong gravity cases. Recently, a paper was published in Physical Review Letters that looked at line spectra from a white dwarf known as G191-B2B. 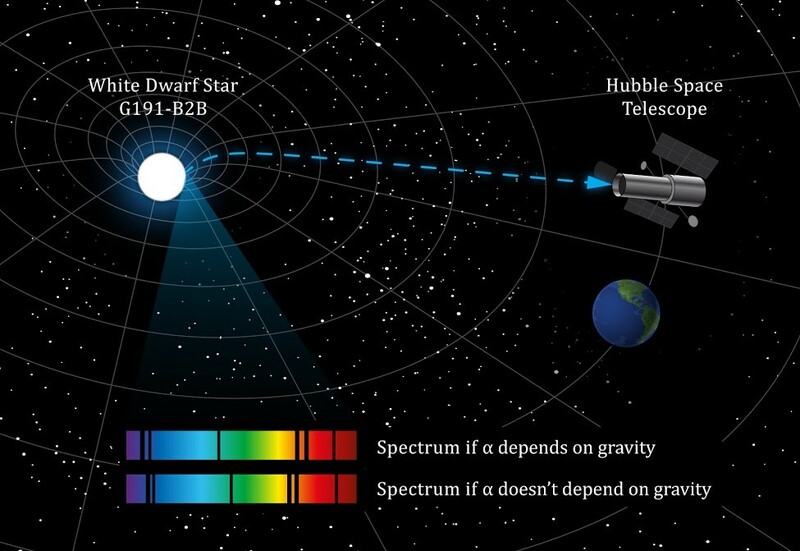 Since the surface gravity of a white dwarf is about 100,000 times that of Earth’s, this provided a good test of whether alpha is affected by gravity. Comparing the line spectra with those observed on Earth, they found no discernable difference, which means any variation in alpha can be no larger than one part in 10,000. These results put a damper on any quantum gravity models where alpha could vary significantly (such as those with strong interactions between scalar and electromagnetic fields). However 1 in 10,000 is not too strong a constraint, so the results still leave the door open on more subtle variations that might give us hints about quantum gravity. For now, however, alpha remains constant.